This week, I’ve been thinking a bit about inspiration and where it might come from. This train of thought was initially sparked by listening to an interview with Martin McDonagh. In it, he was explaining how he had been travelling around on a Greyhound bus in Missouri when the bus drove past a series of angry billboards. He told how the billboards were just a momentary flash in his peripheral vision and then were gone. Just a flash yet, years later, a screenplay emerged and, still more years later, a celebrated film. My train of thought was given a few more rails to ride on by another story I unearthed. This one about Irish songwriter Jimmy McCarthy and the way he wrote one particular song. A while ago, I was browsing through Jimmy McCarthy’s back catalogue and particularly the way Mary Black sings them. I reminded myself of one particular song called, ‘As I Leave Behind Neidin’. You probably won’t know this song but it is remarkable in the level of longing and ‘ache’ it manages to impart. When I heard it again, it made me wonder who (or what) Neidin was, to create such a level of emotion. Was it a person, was it place? For a while I thought it might be a donkey and that's when I decided I had to find out. I went and looked it up and the story was interesting, to me at least. 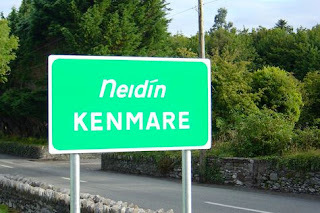 Neidin is the Irish name for Kenmare, an idyllic small town in County Kerry. Some people might have the name in the back of their minds because Kenmare was one of the teams in the Quidditch World Cup in that Harry Potter book… but I digress. The story I found online describes how the songwriter Jimmy McCarthy was on a drive with a friend from Kerry to Cork. The friend was quizzing Jimmy about where he got his song ideas from. Jimmy decided to show the guy by writing an impromptu song about what he could see. Jimmy looked out of the window and noted he was driving out the far side of Kenmare. He noted the Irish name of the town on the sign and that the sign was surrounded by colourful Rhododendrons. Thus, as a sort of demonstration of how inspiration can be all around us, the song was born. It is amazing how much feeling can be instilled into a thing so mechanically born. That in itself is a lesson in inspiration, I think. That inspiration so rarely arrives fully formed, it is a thing to be nurtured and developed. But first it is a thing to be recognised. In thinking about inspiration and in trying to put some kind of expression on my thoughts, I came up with this. People seem to think of inspiration as a sort of a seed. A tiny thing that lands on you and sparks something inside of you and grows and becomes something in its own right. I think of it a little differently now. I think there are millions of seeds all around us all of the time. Inspiration doesn’t come from the seed, it comes from the fertile ground where the seed lands. I think we spend too much time hunting for the elusive seed of inspiration when perhaps we should be opening ourselves up to see and hear as much stuff as we can and to be a warm damp place where at least some of the seeds can prosper and grow, when they land there. I know, I know, pretentious, moi? But Neidin is a nice song. Have a listen to Mary Black singing it and feel the longing in her voice. And I haven’t managed to see ‘Three Billboards’ yet but I will, very soon now, and I’m very much looking forward to that. Sometimes I feel like writing about my Social Media experience and generally, at least in the last few years, it naturally falls into the form of a complaint. People who know me online sometimes advise me to just leave it alone. Social Media is a bit like City Hall, they say, you can’t fight it. Just go with the flow of it and leave it alone. No good can come of constantly picking at it and moaning about it. I agree with all of that and, taking their advice, I have left it alone for quite a long time now, preferring instead to plough my own furrow and let things be. My excuse for this post, which will be about Social Media and which will probably involve at least some level of complaining, is that I want to explain something. I wanted to explain why my Social Media presence is gradually getting less and less and less. I tweet less and less, I update Facebook less and less and Instagram remains a wonderfully warm and entertaining mystery to me. In trying to explain the reasons for this, I may moan a bit. Forgive me. After this, I will once again plough my furrow and do my best with what I have. I stopped and thought a bit about my Social Media this week. You may note that I generally say ‘My Social Media’ rather than referring to Social Media in general. If I’ve learned one thing about this beast, over the years, it is that everybody’s experience is different. To try to generalise too much is to fail before you begin. So if none of this rings in any way true for you, so be it. I completely understand. So, yeah, where was I? Oh right, I stopped and thought. I tried to think of a suitable metaphor for what my current social media experience is like. Eventually, I decided it was like a door, more specifically a lift door. You know the type, chrome plated, a little glass maybe. Two halves gliding apart to let you in and then coming together to close tight. In the early days, all my online friends and acquaintances were in the lift and I was outside, looking in. They were all squashed a bit tightly together in there, such that you couldn’t always tell exactly where one person ended and another began. But they were generally a smiley communicative group who I murmured stuff into and who usually murmured back. 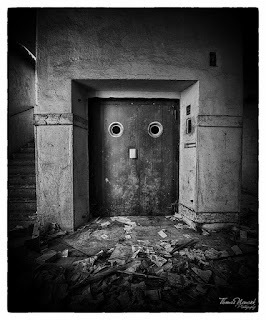 The doors of the lift were wide open, they never closed, and the good folk inside never seemed to want to be anywhere else. Over the years, the doors gradually started to move together. Slowly, almost imperceptibly, the two leaves began to slide shut. It became harder to hear the people inside and it became harder for them to hear you. The voices of the people on the outer edges of the lift car were lost the soonest as the doors eased shut but the central core remained visible and communicative. There was a sense of… well, closure I suppose but it was so slow and so subtle that it didn’t really seem to matter at all. These days, the doors are almost closed tight. It is hard to shout something through the crack and make yourself heard. It is harder still to hear what is being shouted out from inside. Apart from the ever-diminishing gap between the lift doors, there is also the ever increasing noise of the lift machinery. Louder and louder if growls, making it hard to say or hear anything at all. There are a number of mechanisms which work to close the doors or at least to make the gap as small as possible. For one, the increasingly commercial concerns of the Social Media platform favours the stronger voice, the louder shout, the more piercing cry. Mostly, though, the commercial concerns favour… the commercial concerns. Money talks and can be heard most clearly through the crack in the door. And this is what I want to explain. I still love to communicate, to interact, to say silly stuff. Similarly, I love to hear your news and your thoughts and dreams. Your successes still elevate me, you challenges still move me. All this is unchanged. But the energy required to get through the crack in the door is much greater than it ever was before and it is tiring and it wears me down a bit. I still shout through and I still press my ear to the door but I do it less and less. The good thing is that there is more time for other things. I’m writing well, working hard, watching a few more movies, getting some walks in. All that is good. But there’s no denying that I miss my online people and the open door murmurings that used to succinctly colour and enhance our lives. I don’t think I am alone in experiencing a waning energy for dealing with social media. I think that I see it all over the place. I even think there is a subconscious resentment against the media which quietly bleeds onto personal interactions. ‘They didn’t say anything back to me so, just this once, I’m not going to say anything back to them.’ That’s not a big thing, I think many people would deny that it exists, except, if I’m being harsh and honest, perhaps in my own twisted little mind. But I think it’s there and every little thing closes the door a bit more. So, hey, I’m still here and I love to see your stuff and I regularly seek out your stuff out of interest and perhaps in defiance of the forces that try to stop me from seeing it. And now my Social Media complaint is over, hopefully for another year at least, and I will keep on keeping on and will hope to see you around the platforms somewhere. The doors have nearly closed and I don’t see a way that they will ever sit wide open again as they did in those grand old day of yore when we saw everything we wanted to see and were heard by everybody who wanted to hear us. We arrived home after midnight from a journey to London to say a very sad farewell. When you feel that the person you are saying 'goodbye' to would have enjoyed the way you did it, there is some comfort in that. During the few days I was there, as I traversed back and forth across the outskirts of London, a thought occurred that I’m sure I would also have had back when I lived there over twenty years ago. Back then though, there wasn’t the tidy frame of reference that I seem to have for it now. Now we have Harry Potter, in all his incarnations and all his glory. Because of that, I can now say what I must have thought all those years ago. Back when I lived in London, for my fifteen years or so, I did my fair share of Tube travel. In and out to the City Centre, wedged in, rocking and rolling in all of the heat and the interesting smells. It was okay, I didn’t mind it, if I could get a seat, I could always get some reading done. 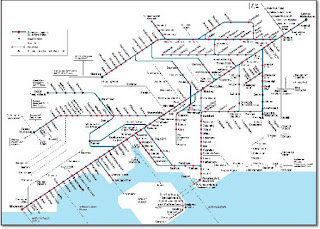 But, in the latter years, my destinations seemed easier to reach by using the rail network. Similarly, this time around, I didn’t set foot on a tube. Instead I nipped from station to station along the rail network and enjoyed the ride. Armed, as I was this time, with all my Harry Potter references, it was plain to see that the Tube was strictly a Muggle form of transport and the rail was for the Wizards. In the books, the Wizards have their own peculiar ways of getting around. Sometimes they seem more clunky and old fashioned than the Muggles’ ways but that is only a superficial reading of the situation. The Wizard ways are fast and effective as well as being slightly quirky and other-worldly. 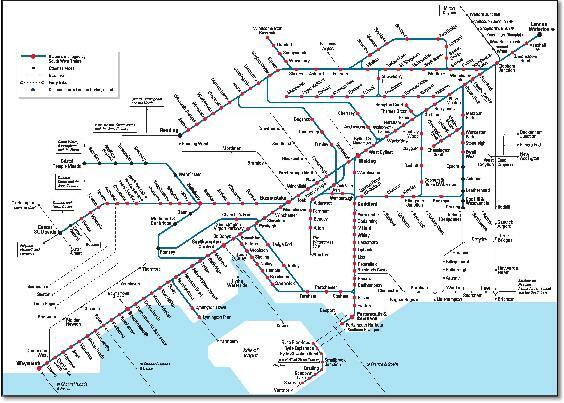 So it is with the rail system. It has about it a strange quality of being in a slightly alternate dimension to the rest of the city. It ploughs through the same landscape and arrives and departs from much the same places but it is slow and yet fast at the same time. High tech yet old fashioned. Familiar but still a bit odd. And the Wizards take the trains. They just seem different to the tube people. More given to noticing that you are there beside them. More prone to a smile. There is space on the trains and light. The staff at the stations seem more personable and, surprisingly for Wizards, human. The train trundles and jangles and clatters and groans but it gets there and you arrive more neatly-pressed, slightly more sane than if you had gone via under the ground. It all makes me wonder about buses. I think that buses might just be a little bit magical too. I’ll try them out next time and report back.